IT News Imphal, Sept 12, Promises and assurances to make sure that the education system in the state reached its peak always turn out as a political gimmick by concern Minister as the truth about inability to conduct HLSC exam by the BOSEM without partiality once more comes to the public domain. Following complaints about irregularities or perhaps negligence to the recently declared HSLC examination conducted by the BOSEM has prompted the authority to conduct an enquiry committee. The testimony of the controller of examination of the BOSEM which was leaked to this media house now stands that favoritism and nepotism still is at large and the head of the board acted to top someone of his her choice in the examination. Well in his testimony to the enquiry committee, L. Phulchand Meitei, the Controller of Examination of the Board of Secondary Education Manipur , (BOSEM) said that the present procedure adopted in coding of the Answer scripts and its custody is not 100% full proof even though he didn’t pin point the source of possible leakage. The testimony of L. Phulchand is a direct indication of possible leakage of the code. This would grant a privilege for those in the top to act on his will. He stated that the Secretary / Chairman of the BOSEM on May 24, 2018 in his office room , in the presence of S. Kiran Singh , Additional Head Examiner (English), Under Secretary Examination forcible instructed to deduct 1 (one) mark each from Question Nos. 1© and 3(b) which was complied. As per his testimony students appearing and competing for the position are also using means to make sure that their answer scripts are identified and he pointed out such matter however no action has been initiated. May be as a follow up action the Chairman of the BOSEM has been replaced by an government order . But the question is a replacement of the head will help little in delivering justice to all the students until a concrete system is formulated. 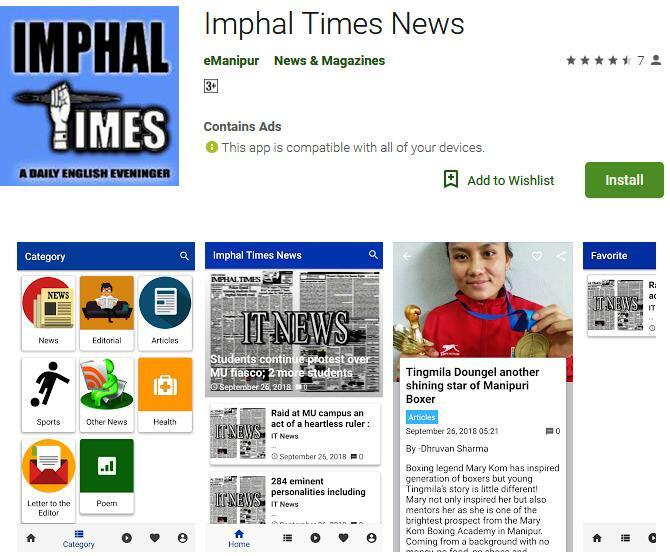 IT News Imphal, Sept 12, State media is now put in dilemma on which one to accept as the Manipur University have two VC office. One – open by VC AP Pandey at his official quarter located at Sanjenthong here in Imphal East and the other at the Manipur University A –Block being look after by an in char ge VC Prof. Vishwanath after the Registrar in connivance with the Chancellor of the University had given leave to Prof. AP Pandey to proceed the enquiry against him which was set up by the MHRD. As of now Prof. AP Pandey had challenge the constitution of the enquiry committee as well as the validity of the Memorandum of Understanding (MoA) signed between the MHRD representative, Manipur govt. representative and the MU community in the presence of the Chief Minister of Manipur and his cabinet colleagues. The case in the high court will continue hearing on September 17, but as of now the High Court of Manipur had made any interim order regarding the petition filed by the Prof. AP Pandey . Beside the fact that the in charge VC of the Manipur University Prof. W Vishwanath had replaced a new registrar as internal arrangement for smooth conduct of the enquiry , Prof. M. Shyamkesho , the former in charge registrar , who was suspended by an order of the i/c VC keep issuing notification mentioning that he still hold the office of the registrar in charge. In a notification , Prof. M. Shyamlesho said that Prof. W. Vishwanath has no legal authority to issue orders or notification from September 1 as Prof. AP Pandey has resumed of fice on that day . IT News Imphal, Sept 12, Kangleipak Students’ Association (KSA) has appealed all concerns no to interfere to the stay of transfer order of a teacher of Jiribam Higher Secondary School. A statement issue by the KSA Jiribam District Council said that some vested interested persons are missing the name of the KSA through media to the transfer or stay of the transfer order of the teacher . KSA appealed not to repeat such act. It also added all concerns not to call boycott of classes as it would amount deterioration of the students’ career . Students are the pillar of the future and any disturbances while grooming the students should be called off, the KSA statement added. the KSA Jiribam District Council further appealed all authority to to use student community as tool for their agitation. It said that students should be protected at any cost and KSA will stand always for the welfare of the students. Sept 12, The age old traditions existed among the various community of the state is a clear picture of the identity of each community . But if the tradition is extinct it is the end of the community . This was stated by Ningthoujam Toyai Chakpa, Village Chief of Phayeng, in Imphal West district whle speaking during the 4 th Loinasillon Khongchat of the Kangleipak Kangleipak Loinasillong Apunba Marup. The programme which also include recitation of poem by 22 different poets of the state was held at the Yoga Hall of Phayeng Makha Leikai. Highlighting the importance of the writers, the Village Chief of Phayeng said that whatever learnt be him today are from the writings of the scholars . “It is time that each of us recognised the role of the writers to introduce our society through our traditions and culture to the world community”, Toyai Chakpa who also attended the chief guest of the programme said. Elaborating on the Chakpa Community , Toyai Chakpa said that the community have a long history with unique traditions, culture, religion and had one time ruled the Kangla. He expressed apprehension about the deterioration of the culture, traditions and religion of the Chakpa community as they have been scattered at many place. “T o save the culture, traditions and religion of the Chakpa Community writers should play their role”, Toyai Chakpa added. Sahitya Academy award winner Sharatchand Thiyam while speaking on the occasion appreciated the work culture of the village youths. He said that it is the youths of the village that keep the traditions alive. R & V Art House is a firm founded by Robin Wahengbam and Dr Vijita Ningombam to create a platform for Manipuri artists so as to showcase their works at National and International levels and to grow as artists. The firm’ s main objective is to help in preserving the art works of many unearthed and known talented artists of the state of the past, present and to take up step towards solving unemployment problems of artists of Manipur , and in the process, helping them grow in the global platform. Thus the R & V House intended to act as a stepping stone for promoting Manipuri artist. Along the above lines and congruently , the R & V Art House in collaboration with Manipuri Folk Music launched its art fête, the first of its kind under the banner “Manipur ’s first book of Art / Art Fest 2018 at Hotel Imphal on 9th September 2018which was inaugurated by the Hon’ble Speaker of Manipur Legislative Assembly Y Khemchand as Chief Guest. The theme of the Fest was - ‘A LL AR T WORKS ARE RELA TED TO MANIPUR (ENVIRONMENT ALLY FOCUSED , COMMUNITY BASED OR DEALING WITH CRITICAL ISSUES RELA TED TO THE PUBLIC )’. The fest exhibited works of 30 artists, the winner was awarded Rs 50,000 and the remaining 29 participants were awarded Rs 2,000 each respectively . Speaking at the event, Y Khemchand lauded the R & V Art House for organizing the unique event, the first of its kind in Manipur . “Although it is a small state with a small population, Manipur has many talented individuals. All we need is support. Therefore we should learn to appreciate each other ’s talent and give positive feedback and positive criticisms,” he said. Recognizing the efforts of art lovers, Y Khemchand said that he will extend his full support to develop and help the artist expose their works in International arena. Co - founder Wahengbam Robin, a renowned artist of Manipur , expressed concern over the lack of books and documents on art history , origin and development of Manipuri art and said that he is in the process of filling the gap with experts and historians. Co-founder , Dr Vijita Ningombam in her speech said”Although it is a small state with a small population, Manipur has many talented individuals. All we need is support. Thus we should learn to appreciate each other ’s talent and give positive feedback and positive criticisms,” . Fine Art (Graphic) Professor Nirmalendu Das of Shantiniketan Vishwabharti University attended the event as a jury member as well as the president of the event held in Imphal. The firm’ s next exhibition will be held in Mumbai, India followed by Florida, USA. They will also be publishing a book, Manipur ’s First book of Art which will contain history of art in the state as well as a compilation of works of contemporary artists. ROBIN WAHENGBAM Co-Founder Robin is a well- known artist who has specialized in graphic art. He completed BF A from VisvaBharati University , Santiniketan. He has participated in a number of art workshops and camps. His artworks including paintings in various mediums have been exhibited in various state and national level art exhibitions organized by Academy of Fine arts, Kolkata and Manipur State Kala Academy , Imphal. As a creative artist, he has also designed the stage and ambience for Manipur Tourism Sangai Festival. Ambience and art installation for inter-cultural dialogue between North East India and South East Asia for IGNCA, New Delhi. Production design for Ford Foundation Production Film - ‘Soldiers in Sarong’. He has also designed the mascot for the Vth National Games held in Manipur in 1999. He has been honored twice for UGC Educational Films in Animation and Graphic Art in 1998 and 1999. In 2011, he was awarded the Manipur State Kala award. His art collection has been spread around globe like the CARR for Human rights, Harvard Kennedy School, Cambridge, Massachusetts etc. It is his passion in the field of art that inspired him to have found R & V Art House along with Dr Vijita Ningombam. Dr VIJITA NINGOMBAM Dr. Vijita has a very well-rounded background that encompasses the creativity of art, the logic of science and the compassion of social work. All of these qualities inspired her to found R & V Art House along with Robin. Dr. Vijita’ s interest in art began at a very young age. She has painted many canvases and competed at state and national level competitions. Her artwork was selected and published by The Hindu. At the age of nine, she acted in the Manipuri movie Khamba-Thoibi released in 1997, playing the role of Khamnu who raised little Khamba as a child. In 2003, she was a model for a documentary film called Phanek for Doordarshan and in 2008, she was the VJ for a TV show for NETV called NE Hi-fi Manipuri Music Countdown. She got offers to go into mainstream Bollywood, but instead chose a fruitful career in medicine. She graduated from Utkal University in Odisha in 2010 and later completed a fellowship in Cosmetic Medicine in Apollo Hospital in New Delhi. She is a social activist writer whose articles have been published in The Hindu, Indian Republic News Portal, Imphal free Press and E- pao.net. She also has a compilation of short stories and articles she writes in a personal blog. Churachandpur- As part of the S tate Government’ s noble mission, “Go to Village” (Khungang Chatse), camps were held today at Head Quar ter V eng for Lamka & 15- Hiangtam Lamka covering 5 Villages (Chiengkawnpang, Lalzomlien Veng, Thengra Leirak, Head Quarter V eng and Hill T own). Attending the function at Head Quar ter V eng Community Hall Shri J.C. Ramthanga, Principal Secretary (Cooperation) and Nodal officer of ‘Go to Villages’ mission for Churachandpur and Pherzawl Districts said the mission’ s objective is to provide services to the people at their doorsteps while encouraging Government Officials to discharge official duty with responsibility , honesty , accountability and without discrimination. Dignitaries attending the function included Shri Ramsang Infimate, ADC Churachandpur , Shri Thangboi Gangte, SDO Churachandpur and other DLOs. Under Ujala Scheme, 50 beneficiaries received 200 light bulbs from MSPDCL. A total of 65 shoes for Boys & Girls were distributed to the students Vimala Raina Govt. High School by the ZEO, Churachandpur . District Handloom & Textiles department issued 30 Weavers ID Car ds to several beneficiaries. Bishnupur – The District Administration organised three camps at Campus of ICDP , Yangoiningthou Community Hall in Bishnupur Sub Division and Haoreng Chingyang Community Hall, Thanga in Moirang Sub Division. ‘Rashtriya Poshan Maah’ – The National Nutrition Month was also observed in all the three camp sites. The participants took Pledge to promote and convey messages about the importance of nutrition, hygiene and sanitation. Line department officers opened stalls and conducted awareness campaigns on different government programs and schemes. LPG connections, distribution of fertilizer (urea), Biometric enrolment of Aadhaar , banking services and delivery of different government schemes to the beneficiaries were also done. To ensure proper delivery of services in the camps, Oinam AC MLA, L. Radha Kishore, Thanga AC MLA Tongbram Robindro Singh, and Secretary PHED, Nidhi Keshwani along with Deputy Commissioner Bishnupur Pawan Yadav visited the camps. Kangpokpi: For Kangpokpi District, GTV camps were organised at Sinam Kom, Ngakhopat, P . Khonomphai villages of Saikul Sub- division and Laikot Kom and Laikot Phaijol villages of Lhungtim Sub-division. During the camps, different line departments delivered their services to the villagers. The Department of Veterinary & A.H, Kangpokpi vaccinated various animals and livestock. The Department of Agriculture and Horticulture also distributed various HYV seeds to the farmers. Besides these, an orientation programmes of the ASHA ’s, AMN’ s and BPMU was organised today at the Kangpokpi District Hospital in connection with the National Nutrition Month observation and PM’ s Direct SAMV AD with frontline health workers. Thoubal- Camps were held at Wangjing Laikon Community Hall, and SEDO Club, Y airipok. Around 30 stalls of different departments were opened to attend the queries of general public. As a part of National Nutrition Month weighing of kids from 0 to 6 years and giving awareness to the pregnant women and lactating mothers about nutrition were also conducted at camp venues. Spot painting competition of school students and distribution of shoes were held under the initiative of ZEO Thoubal at the camp venues. Health check up & Health Cards under CMHT were given to the beneficiaries under the initiative of CMO, Thoubal. LPG gas connections were distributed to the beneficiaries under the Ujjwala scheme. W eaver ’s cards were also distributed to the beneficiaries by District Handloom & Textiles department. MLA Wangjing-Tentha, Shri P. Brojen attended GTV camp held at the Wangjing Laikon Community Hall. Deputy Commissioner Thoubal, Smt. Haobam Rosita also visited the camp venues to look into the functioning of the “Go to Village” mission. Tamenglong - The District administration of Tamenglong today organised GTV camps at community hall of Duigailong Village in Tamenglong District. 8 (Eight) villages namely Duigailong, New Canan, Happy V illa A, Happy V illa B, New Salem, Model Village, Dimthanlong and New Lambulane are covered in this mission. Shri. Namlalung Gangmei, Sub Deputy Collector of Tamenglong gave a brief introductory speech of ‘Khungang Chatse’ to the villagers who attended the program today . Medical department also conducted general OPD and distributed free medicines to the people who attended the program. ST certificates, Domicile, Permanent Residential and Income certificate were also distributed to the applicants on the spot. More than 800 people attended the programme. IT News Imphal, The Government of India has awarded the State Institute of Rural Development, Manipur under the Department of Rural Development and Panchayati Raj, Manipur with the Best Performing SIRD in North East India. The award was presented by RD, PR and Mines, Minister Narendra Singh Tomar at the National Award Distribution Function organised by the Rural Development, Government of India, at the Plenery Hall, Vigyan Bhawan, SIRD Manipur awarded best performing SIRD in ne India New Delhi on Wednesday State Rural Development and Panchayati Raj Minister Thongam Biswajit Singh has lauded the Additional Chief Secretary M.H.Khan, RD&PR Director Dr .K.Shyamsunder , faculty members and staff of the SIRD on their performance. He praised faculty members, officials and staff of the institute on their achievement and further appealed and requested to provide quality training so that they could compete in the All-India level. The award is giv en based on the SIRD’ s performances in respect of training programmes conducted and number of participants trained during the last year and the infrastructure available for trainings. SIRD, Manipur conducted 947 trainings in different flagship programmes of the central government including the MGNREGS, Recurring Fund of MoRD, RGSA, Law and Justice, Other Training Courses (OTC) which were participated by altogether 40,439 trainees. The State SIRD campus has also modern training facilities including wi-fi internet and computer con nectivity with video-conference, etc. Imphal Manipur is all geared up for the Swachh Survekshan 2019, the pan India cleanliness survey which will focus on citizen participation and sanitation sustainability as key factors for grading the cities. The Ministry of Housing, Urban and Af fairs (MoHUA), Government of India will be carrying out the fourth edition of the sanitation survey from 4th to 31st January , 2019. In order to spread awareness regarding the survey to the concerned stakeholders, Department of Municipal Administration, Housing and Urban Development (MAHUD), Government of Manipur organised a one-day workshop on Swachh Survekshan 2019 yesterday at the City Convention Centre, Palace Gate. MAHUD Minister Thounaojam Shyamkumar in his speech as the chief guest of the function announced that his department will give monetary assistance of Rs 2 lakh each to all the urban local bodies for the upcoming cleanliness survey . He said it is really a proud moment for the State to achieve an open defecation free (ODF) status. Assuring that the State Government is committed to strengthen the urban local bodies, Th. Shyamkumar said filling up of vacant posts/ required staffs and systematic functioning of the elected representatives/members will be put forward in the Cabinet meeting. Concluding his speech, he appealed the citizens of the State to wholeheartedly participate in the upcoming cleanliness survey to increase the S tate’ s ranking. N. Gitkumar Singh, State Mission Director , SBM (Urban), MAHUD Director and Chief Town Planner in his key note address informed that the regional workshop was scheduled for 12th September , 2018 (tomorrow) at Guwahati, Assam. A separate workshop has been organised for Imphal after requesting the authorities for maximum participation of people for the cleanliness survey , he added. As part of the function today , ODF certificates were distributed to the representatives of the urban local bodies. All the 27 urban local bodies (ULBs) of Manipur have received an open defecation free (ODFs) status. Manipur is now among the 18 states in the country to become an ODF certified state. Swachh Survekshan 2019 will be conducted under Swachh Bharat Mission-Urban (SBM- U) for a total of 5,000 marks, compared to 4,000 marks in the previous survey . MoHUA has revised the weightage in each category namely - service level progress (SLP), direct observation, citizen feedback and certification. Certification category is a new addition, where emphasise will be given to open defecation free (ODF) status of the cities by a third party deputed by MoHUA to ensure on sustainability of the sanitation. This time, ODF plus and ODF plus plus guidelines are formed to make open defecation free status sustainable and ensuring behavioural change. While the ODF plus protocol focuses on sustaining community/pubic toilet usage by ensuring their functionality , cleanliness and maintenance, the SBM ODF plus plus will focus on achieving sanitation sustainability by addressing complete sanitation value chain, including safe containment, processing and disposal of faecal sludge and septage. Citizens can give their feedback on the web portal ‘Swachh Manch’ which was launched on August 13, 2018 with a motive for the citizens to connect and contribute to the overall cleanliness of their respective areas. The portal will enable to upload pictorial evidence of citizens and organizations participating in the initiatives, as well as to record the number of hours volunteered, as acknowledgement of citizens’/ organisations’ efforts and contributions to the cause of cleanliness. Apart from it, citizens can send their feedback at Swachhata App. Urban local bodies will have to update their monthly on-line MIS on SBM (U) portal, upload indicator wise supporting documents on Swachh Survekshan 2019 portal by 15th December , 2018 along with uploading City profile by 30th November , 2018 to ensure systematic reporting of facts which shall be validated during the survey . State and city levels campaigns are being promoted in order to educate citizens about the objectives of the survey and survey methodology as well as to make awareness regarding people’ s participation. The objective of the cleanliness survey is to encourage large scale citizen participation, ensure sustainability of initiatives taken towards garbage free and open defecation free cities, provide credible outcomes which would be validated by third party certification, institutionalize existing systems through online processes and create awareness amongst all sections of the society about the importance of working together towards making towns and cities a better place to live in. Additionally , the survey also intends to foster a spirit of healthy competition among towns and cities to improve their service delivery to citizens, towards creating cleaner cities. This time everything will be done through online.